and monitor the progress of a CME on its path from the Sun to the Earth. Here is a larger version. Flaring activity is closely associated with sheared magnetic fields. The twisted magnetic field above sunspots are sites where solar flares are observed to occur. 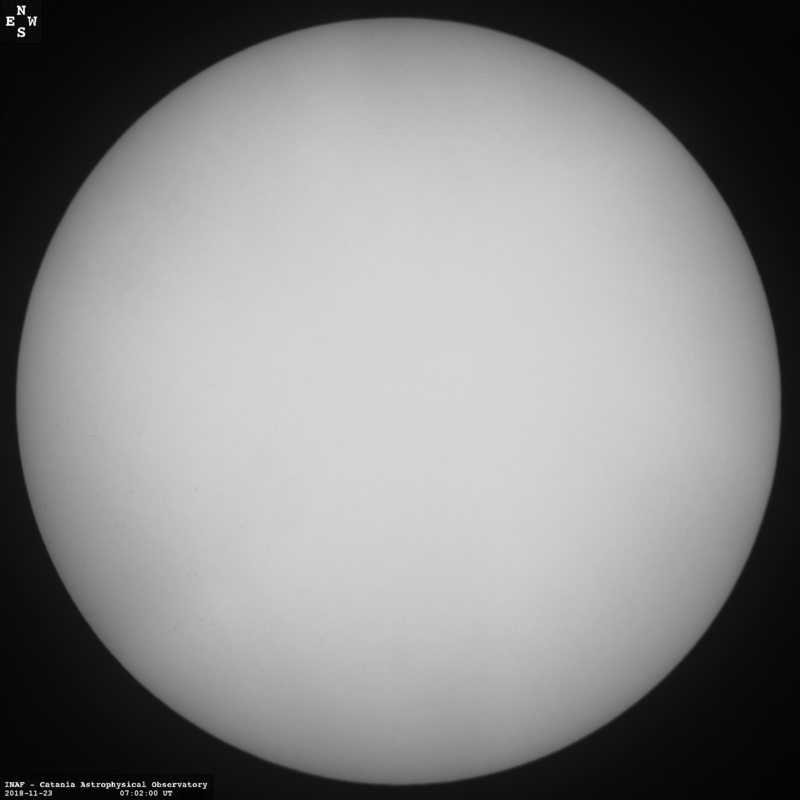 One way to track solar activity is thus by observing sunspots. -the total magnetic flux in the active region, through the first McIntosh parameter (Z) which is correlated to the separation of the two polarity regions and the active region area, and through the third McIntosh parameter (c) which describes the compactness of the central spot. -the magnetic field of the largest spot, through the second McIntosh parameter (p) which is related to the size of the largest spot. One way to predict the occurence of solar flares is thus to look at the probabilities for the occurence of C-, M- and X-flares, based on statistics of McIntosh classification. Click on a Catania sunspot group reported on the most recent solar map, and look for history plots of these probabilities and history plots of the area and number of spots in the group. See for instance the history plots for the latest Catania sunspot group #2, #19, #80, #85 or #98. 2. You may also use the magnetic classification of active regions as a proxy for the magnetic complexity. This is given (in red) for each NOAA region reported on the solar map. Look also at the recent magnetograms, such as the SOHO MDI 6767Å magnetogram, the CaII 8542Å magnetogram (Kitt Peak), the FeI line magnetogram (Mt Wilson) or others available here. 3. The recent flaring activity indicates which regions are effectively active. The history plot of a Catania sunspot group gives a schematic of time history of flaring since the group is observed on the disk (see examples above). Look also at the recent X-ray flares observed on GOES, event lists and the current movie of SOHO EIT FeXII 195Å. Those are linked on the solar weather page. You may also look at the differential EIT FeXII 195Å movie (GIF format; see NRL page for other formats). 4. The level of flaring activity to expect depends strongly on how the X-ray background level evolves. Highly complex configurations may only produce C-class flares if the background level is low, and vice-versa. Check the X-ray background level on GOES. 1. Check first the radio flux values provided by 5 radio observatories (Learmonth, San Vito, Sag Hill, Penticton and Palehua) and reported by SEC (in addition, you could check the latest report from DRAO Canada, the quiet sun radio flux measurements from Learmonth or the near-real-time solar radio indices from Trieste). 2. Look at radio images from Nancay (164 & 327MHz) and latest movies from Nobeyama (17GHz). See on the East limb if returning regions are about to reappear and would contribute to increase the 10.7 cm radio flux. On the West limb, see if regions are about to turn behind the solar disk, contributing to a decrease of the 10.7 cm radio flux. This budget is related to the number of spots on the disk, but also on the limb and just behind. It is therefore useful not only to check the photospheric white light continuum (such as the latest SOHO MDI continuum or the latest Catania observation) but also to watch out for expected returning regions and for those regions turning behind the West limb (see the solar map). 3. Watch out also for coronal holes (see the latest SOHO EIT FeXV 284Å & the Kitt Peak coronal holes map), which can contribute to a decrease of the 10.7 cm radio flux, when they extend on the solar disk. 4. Relying on the 27-day recurrence period, one can also adjust the predictions according to the trend observed 27 days ago. 1. either with flares (long duration flares in particular). Those CMEs move generally fast. 2. or quiescent prominence (filament) eruptions. Those CMEs are generally slower. 3. EIT dimmings (EIT wave): see the differential EIT FeXII 195Å movie. 4. Radio type II bursts: which then indicate the speed of the CME front (see the list of radio bursts prepared by SEC or/and the latest Culgoora PRESTO message). The coupling between the solar wind and the earth's magnetic field is much stronger when the IMF is southward, and the longer it stays southwards the better. Look in ACE data for negative Bz <-10nT, showing that the IMF is southward. The white line shows the total field B. The red line shows the z-component Bz. In general, auroral activity will be driven by a fast solar wind. Look in CELIAS/SoHO and/or ACE data for high wind speeds - larger than 500 km/s. 1. The high-speed solar wind is known to originate in coronal holes. Coronal holes are associated with "open" magnetic field lines and are often found at the Sun's poles, but may also be found at lower latitudes. Solar wind gusts from the hole can hit Earth's magnetic field. Look at the latest SOHO EIT FeXV 284Å & the Kitt Peak coronal holes map and watch out when the hole(s) turns on the West side of the central meridian. 2. You may also see sudden increases in the solar wind speed which shows when the shock wave from a CME passes the satellite. Look at the latest activity report and movies from LASCO coronographs C2 (2-6 Rs FOV) and C3 (4-30 Rs FOV). To differentiate a back-sided from a front-sided halo CME, use the differential EIT FeXII 195Å movie. It is believed that the CME speed changes as it travels in the heliosphere due to the influence exerted by the solar wind. As a result, a CME starting out near the Sun with a speed of 200 km/s would take 4 1/2 days to arrive at Earth. On the other hand a fast CME with an initial speed of 1000 km/s would arrive in 2 1/4 days. In case of one or more "halo" events directed towards the Earth, you may obtain (check the Halo CME Mail) or measure the speed of the CME in the plane of the sky and use this prediction curve to estimate its arrival time at Earth (credit Catholic University of America, see details here). Long duration flares are generally accompanied by CMEs, contrary to short duration flares (<30 mn) which show no association to CME events. If the CME is related to a flare, get the flare duration at around 2695Mhz if possible and use this tool from IPS to estimate the arrival time of an interplanetary shock. If, as often, the CME is associated to a type II burst, the speed of the CME may be obtained from radiospectrography. Check the list of radio bursts prepared by SEC. But you may also try to see them in the data of the Culgoora radio spectrograph, the Nancay decametric array, the AIP-OSRA Sweep Spectrometer, the Bruny Island Radio Spectrometer, the realtime HiRAS data or other links available here. 1. Protons: in the top graph of the GOES satellite enviroment graphics, watch out for a rise in the proton flux levels. Alert is given when the levels pass above the acceptable threshold (the dashed line). 2. Electrons: watch out for the second graph. The impact of high-energy (relativistic) electrons on orbiting satellites can cause electric discharges across internal satellite components, which in turn leads to spacecraft upsets and/or complete satellite failures. The Relativistic Electron Forecast Model (SEC) predicts the occurrence of these electrons in geo-synchronous orbit. 1. Flares can produce large numbers of energetic particles that escape to interplanetary space and result in major SEP events. Watch out for particularly threatening sunspot regions (with high risk of flaring) on the western side of the solar disk, or that have turned recently behind the western limb (see the flaring guide). 2. CME-driven interplanetary shock waves: most major solar energetic proton events observed near Earth seem to result from acceleration of some solar wind particles by the CME-driven interplanetary shock wave. Space weather forecasting will benefit one day from the shock models currently developed. 1. At L1: monitor the arrival time of a CME front or when the fast stream from a coronal hole is expected to hit the Earth's environment (see details above). 2. At geosynchronous orbit: see data from the GOES magnetometer (the third graph in the GOES satellite evironment graphics, or a detailed version here), showing the averaged parallel component of the magnetic field in nanoTeslas (nT) as measured by GOES. If these data drop to near zero, or less, when the satellite is on the dayside it may be due to a compression of Earth's magnetopause to within geosynchronous orbit, exposing satellites to negative and/or highly variable magnetic fields. On the nightside, a near zero, or less, value of the field indicates strong currents that are often associated with substorms and an intensification of currents in the Earth's geomagnetic tail. 3. The Earth: sharp changes in the Earth's magnetic field are then recorded by magnetograms and the geomagnetic disturbances are rendered by various local indices, among which the K-index. K indices are available online on the Earth's clickable map. On this page also get the latest online infomation on auroral activity.